We all know that Sprinter vans are not known for their wonderful and useful cupholders. I've seen plenty of solutions to this issue, but here is my solution that fixes two issues at once. I simply attached two of the fold-down cup holders to my Koolatron cooler and place the refrigerator between the two front seats, up against the parking brake handle. The driver uses the front-mounted cup holder and the passenger the one mounted on the side. This allows us to keep our cold drinks handy, so there isn't any need to get up and go to the RV fridge while the van is moving and also provides for the necessary cup holders. I may add some of the "hook" side of velcro tape to the bottom of the cooler so that it can engage with the carpet between the seats and prevent any rearward sliding. Any forward sliding is currently stopped by the lip of our Weathertech mat. Now I just need to add a 12-volt cigarette outlet to the existing hole for one in my driver seat pedestal. 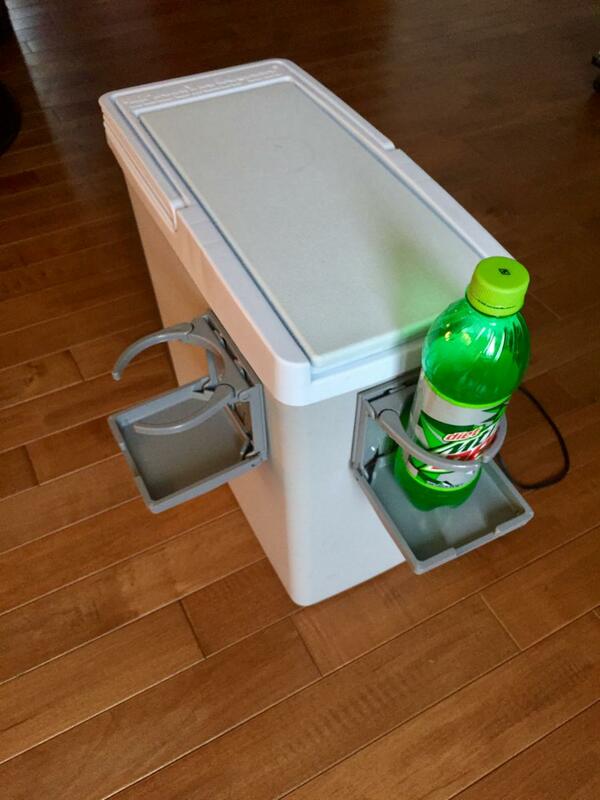 That will provide a more convenient place to plug in the cooler. I'd also wire that 12-volt socket to only be on when the ignition is on. Currently, I fret about accidentally leaving the cooler plugged into the center console outlet as that one is hot all the time; an easy way to drain your starter battery. We got a 30 qt Coleman with 2 cupholders molded into the top and put it between the front seats. Works OK on the pavement, but yours looks better on the bumpies. We also added a cheap 2 cup holder to the ashtray assembly. bolted it to the top of the ashtray insert. Works pretty well. Only cost about $10. I've since added a mini bungee around the bottom to hold it more securely. Yes, I saw the thread about how to install that 2 cup holder and I had ordered one for use when we don't bring the Koolatron for some reason. Just haven't installed it yet. Thanks for the tip on the mini-bungee. Another reason to buy a Transit. Mine had 6 cup holders for the front two passengers and 2 of them would almost hold 2 liter bottles. 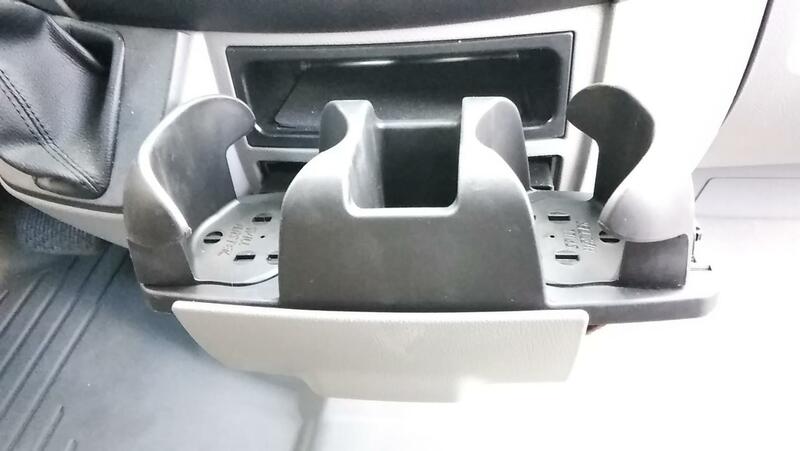 A friend told me that Europeans don't tend to eat and drink in their cars, especially when driving, so maybe that explains the disparity between the number of cup holders in a US van vs a German van. We are considering adding something exactly like this behind one of our dinette seat backs. They would be hidden during the day, behind the inclined seat back, but they would be available to use when the dinette seating is converted into our bed. They could hold our eye glasses, phones, etc. That used to be true, or more true. Look at any European car from the 80's or 90's and you'll find nary a cupholder. Things have changed for the most part. Us 'Muricans have always led the way with our need for bins, pockets, cupholders, cubbies etc. for all of our crap. The Tranit is Ford's 'world' platform and has been sold in Europe for decades. Not sure if the volume of cup holders in the current model is new or old. ...that I used two old dish towels and sewed them into a large sock like shape (thanks mom for teaching me how to sew) and attached old cloth straps to them. I hang them on the arm rests of the driver's and passenger's seats to hold drink containers. Yes, my Chevy Express does have cup holders in the engine dog house cover but they are usually full of other junk.